1. 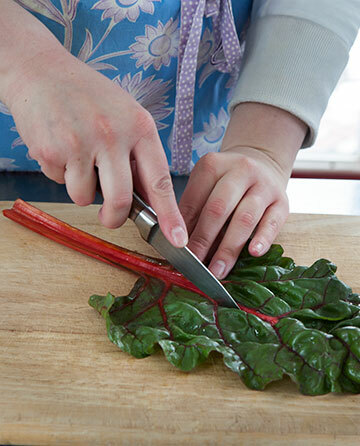 Remove stems from leaves of chard (check in next week for a tasty recipe using the stems). 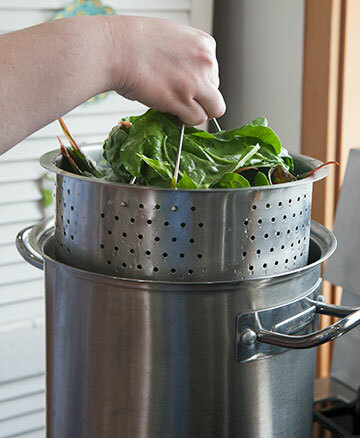 Steam leaves until wilted and transfer to an ice-water bath. 2. 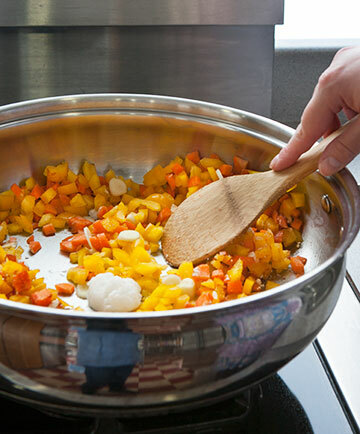 In a medium skillet over medium heat, combine coconut oil, garlic, peppers, carrots, onion powder, salt, and cayenne pepper. 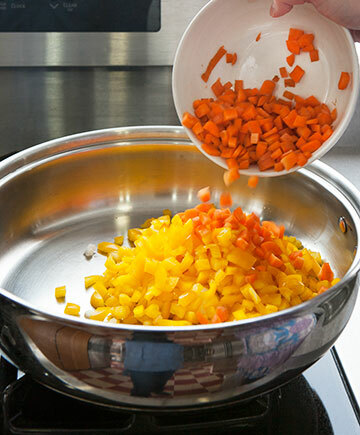 Cook until peppers and carrots are tender-crisp (5-7 minutes); stir in rice. 3. Preheat oven to 300°F. 4. 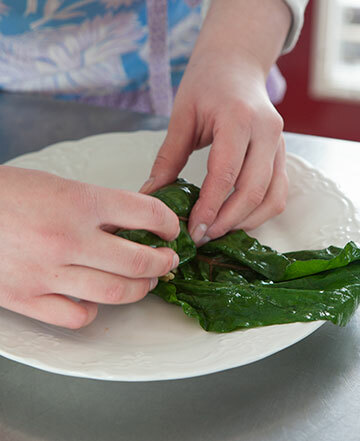 Gently wring water out of chard leaves. Lay one leaf flat, overlapping the sides where the stem was. 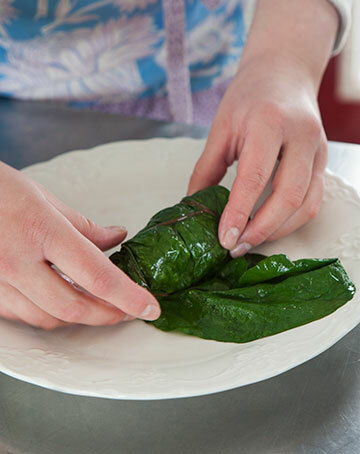 Place about 1/3 cup rice mixture on leaf, fold up sides, and roll up. 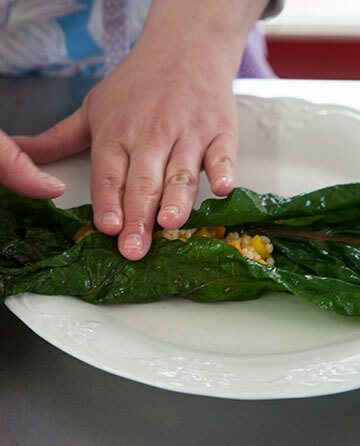 Set in a 9” x 13” baking dish and repeat with remaining chard leaves and rice mixture. 5. Cover baking dish with foil and bake for 15 minutes, or until heated through. 6. 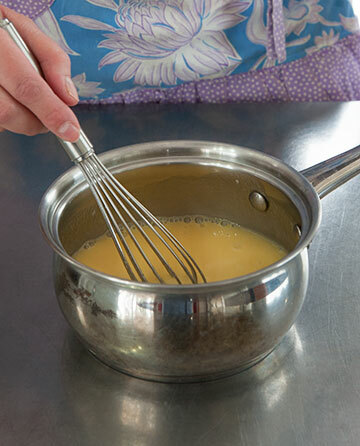 While rolls are baking, prepare sweet & sour sauce: Whisk all ingredients together in a small saucepan and bring to a simmer over medium heat, whisking frequently. 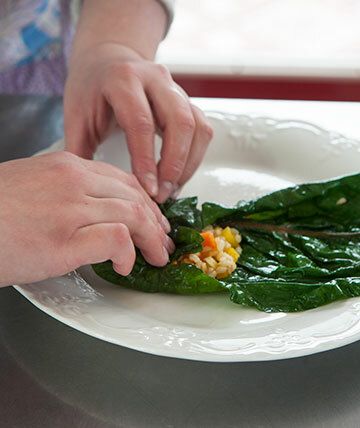 Remove stems from leaves of 2 bunches of rainbow chard (check in next week for a tasty recipe using the stems). Steam leaves until wilted, and transfer to an ice-water bath. 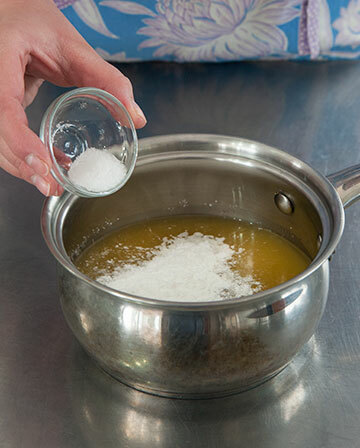 Add 1 T coconut oil to a medium skillet. 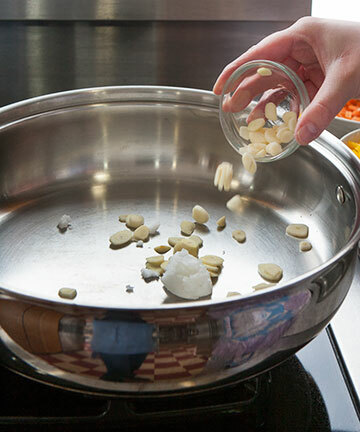 Add 6 cloves peeled and sliced garlic. 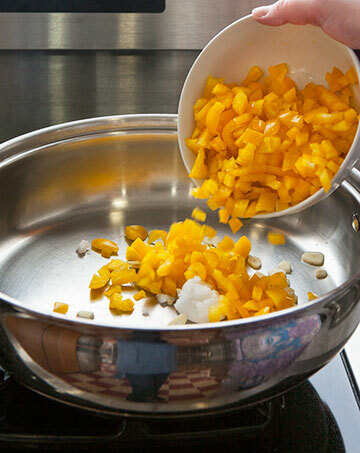 Add 2 seeded and diced yellow bell peppers. 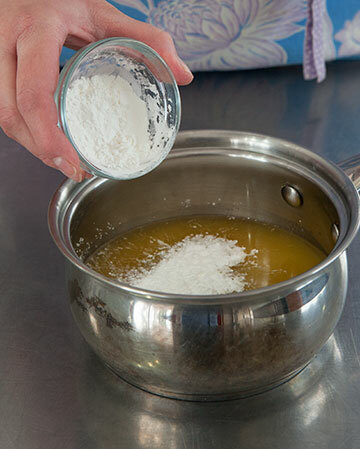 Add 1 t onion powder. 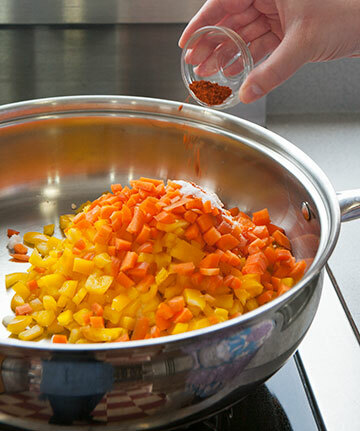 Add 1/4 t cayenne pepper. 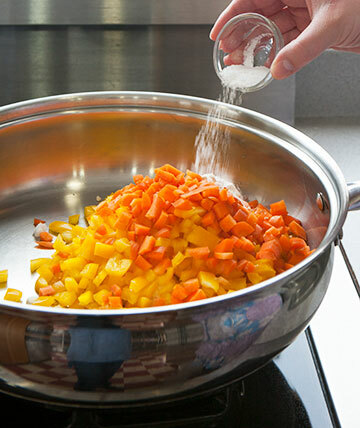 Cook until peppers and carrots are tender-crisp (5-7 minutes). 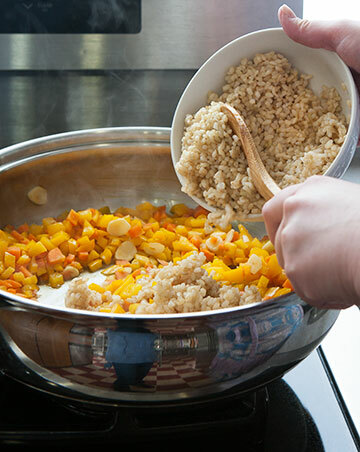 Stir in 2 cups cooked short-grain brown rice. Preheat oven to 300°F. 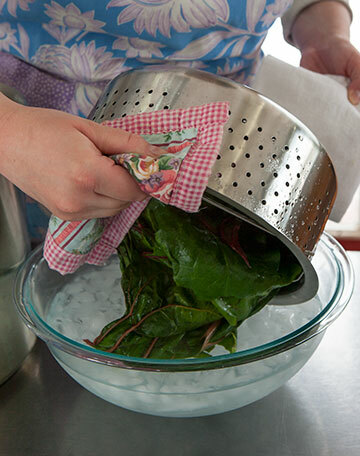 Gently wring water out of chard leaves. Lay one leaf flat, overlapping the sides where the stem was. Place about 1/3 cup rice mixture on leaf. Fold up sides, and roll up. 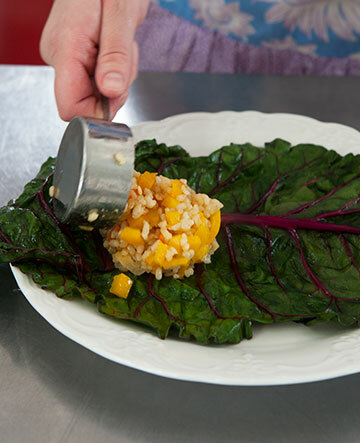 Set in a 9” x 13” baking dish and repeat with remaining chard leaves and rice mixture. Cover baking dish with foil and bake for 15 minutes, or until heated through. 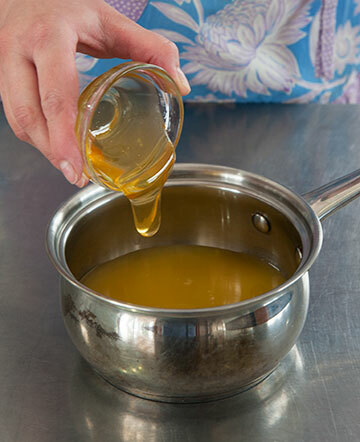 While rolls are baking, prepare sweet & sour sauce. 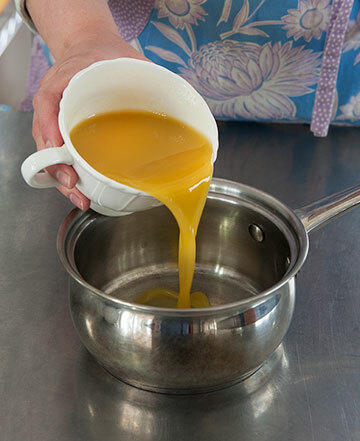 Add 3/4 cup pineapple juice to a small saucepan. 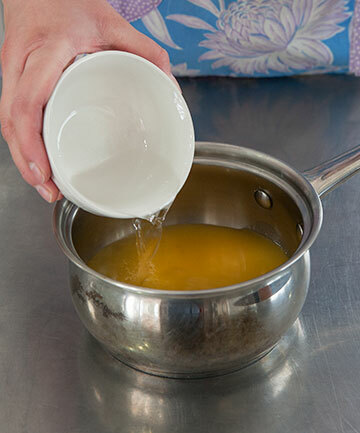 Add 3 T white distilled vinegar. 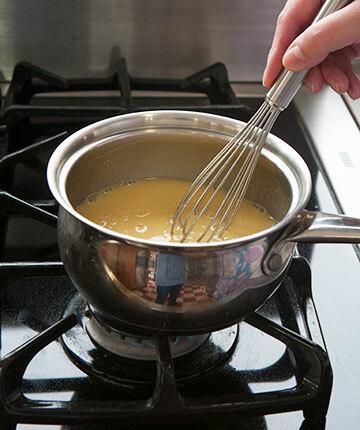 Bring to a simmer over medium heat, whisking frequently. I made these last night! The hubby who is battling a constant chemical taste in his mouth due to medications, both chemo and regular, deemed them “a delicacy!” The three of us devoured all 12 rolls, they were so, so good! 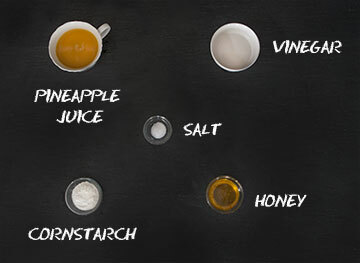 I made an additional table sauce with minced garlic, chopped spring onion, brown sugar, lime juice and zest, fish sauce, tamari sauce, water and crushed red pepper flakes, because we have found that really spicy, zesty seasonings like ‘Siracha sauce’, help my hubby mask the constant bad taste in his mouth. He was in heaven! Thank you so much! Also made the quick pickled rainbow chard stalks, and they are looking like jewels in their jar, sitting prettily in the fridge. Can’t wait to have those! I Think I will try these this summer when my garden is in. 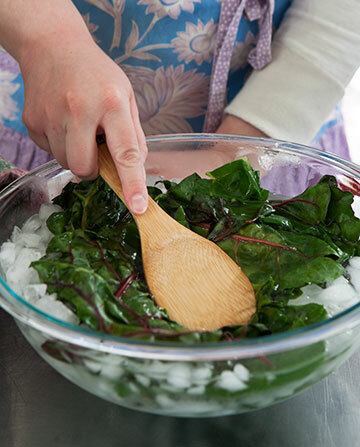 Would beet leaves work instead of chard? I think beet leaves are a good idea. I’d like to try them myself. How about we both report back as to whether or not they work okay???? 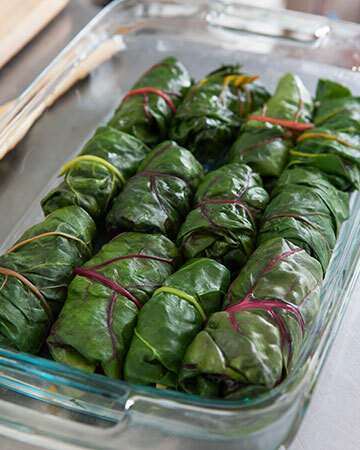 Mary Jane -I have cooked beet leaves and they are delicious. For years I threw them away and then I read they are similar to chard. I made some last season and they were delicious. Now to convince my pet hare that they are great. 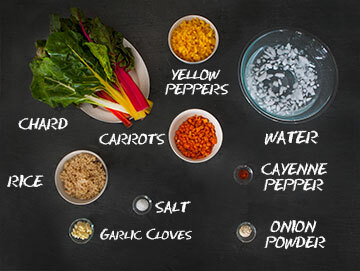 As an old hillbilly I think mustard and collards are the very best, but chard is so beautiful and so prolific. We grow it and eat it and we have a lot to throw to our chickens. Good morning to you, Barbara! Last week I planted a mess o’ collards and beets (and chard of course) in my greenhouse. I love ’em too. Got any good mustard greens recipes? I should try that also. 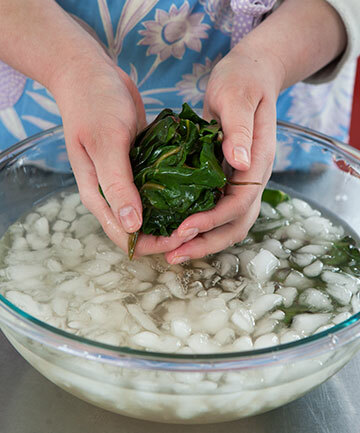 The best way to cook mustard greens is the same as collards Put bacon and onion with them and co0k them in chicken broth. 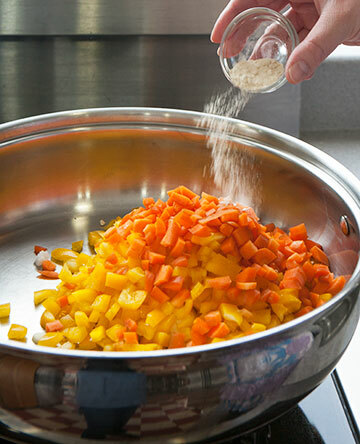 Add some salt and pepper and vinegar- I like some garlic too. You can chop up boiled eggs on them. My friends were so po0r in college that they lived on this, I developed a taste for it also. I could probably live on bacon and eggs, oh and greens, too! Add some garlic (and a bit of onion) and I’d be set for life. Thanks Barbara! So happy to see a vegan recipe! 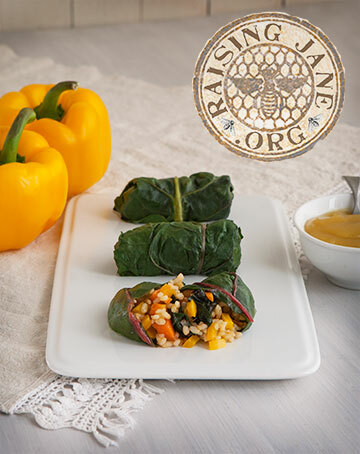 Yum, I do love Rainbow Swiss Chard along with lots of other types of greens. As always , Ashley’s recipe looks picture perfect and delicious! I bet everyone enjoyed your Spring rolls.